What does it feel like to actually use the AmigaOS 4 operating system? I’m sure many of you have pondered that question yourself, after reading yet another item on OSNews about the struggling platform, or when diving into an Amiga board and reading the various posts from people waxing lyrically about how good it is. Let’s first take a look at the kinds of day-to-day applications you’ll encounter (or not). The web browser is obviously the most important application in today’s modern world of computing. For a long time, this was a very weak spot of the Amiga, but recently, this situation has improved greatly thanks to the arrival of the Origyn Web Browser, which brings all sorts of modern browser goodness to the Amiga: CSS, tabbed browsing, bookmark manager, you name it. It uses the WebKit engine, and while it does a good job of rendering a lot of pages, there are still some obvious rendering issues in a lot of websites, but none that make it unusable. The browser is being updated continuously for both AmigaOS and MorphOS, so the situation will only get better. When it comes to emailing, there’s really no going around YAM, Yet Another Mailer. This is a mammoth of an application, so packed with features that it all looks a little daunting at first. Once you get into it though, it’s actually quite easy to use as all the advanced features don’t really get in the way of normal email usage. One really annoying problem with YAM, however, is that it has a lot of issues when it comes to remembering window and column sizes. After sizing the window the way you want it, including the width of the columns inside the email list, it’s kind of a nasty surprise to see that all is lost when you re-open YAM after closing it. Overall though, a good application that reminded me of BeAM for BeOS – never a bad thing to be reminded of. Speaking of windows, the AmigaOS seems to have a more persistent problem with retaining window sizes – almost every application refused to remember window sizes, which really starts to get on your nerves after a few days. When it comes to instant messaging, the situation can be a little murkier, depending on your protocol of choice. AmigAOS4 used to have Epistula as a multi-protocol instant messaging application, but it hasn’t been updated in a while, the version at OS4Depot.net doesn’t work on AmigaOS 4.1, and the project’s website is dead. You could use GAIM, but you need a Cygwin-like environment which I find too much hassle. SabreMSN is made by the same people behind the legendary WookieChat IRC client, and it works remarkably well. It has a very decent interface, lots of features, and you can even receive and send nudges (or turn them off, obviously). Using the Jabberwocky Jabber client, you can also connect to various other IM networks by using the transport feature of the Jabber network. Still, a modern, up-to-date multi-protocol client would be a very welcome addition, maybe something like Miranda whose conservativeness seems to fit the AmigaOS well. Multimedia-wise, you’ll feel a bit left behind on the Amiga; DvPlayer is able to play back just about any video format under the sun (including DVDs and separate subtitles). Well, that’s the theory, anyway; the “special version” included with AmigaOS 4.1 has a few limitations, the biggest of which is that it cannot playback .avi files. Yes, you read that right. You have to pay in order to playback .avi files and to get updates. There’s also an MPlayer port, but this lacks a lot of features, and more annoyingly, it didn’t playback any sound. There are several audio players available as well, of course. Flash is currently not yet supported, but there is a lot of promising work underway in bringing Gnash to the Amiga, both as a stand-alone player as well as an OWB plugin. When it comes to productivity software, I felt a bit bummed by the Amiga. There are countless word processors available, but they’re all hopelessly outdated, and sometimes the parent companies have long gone. 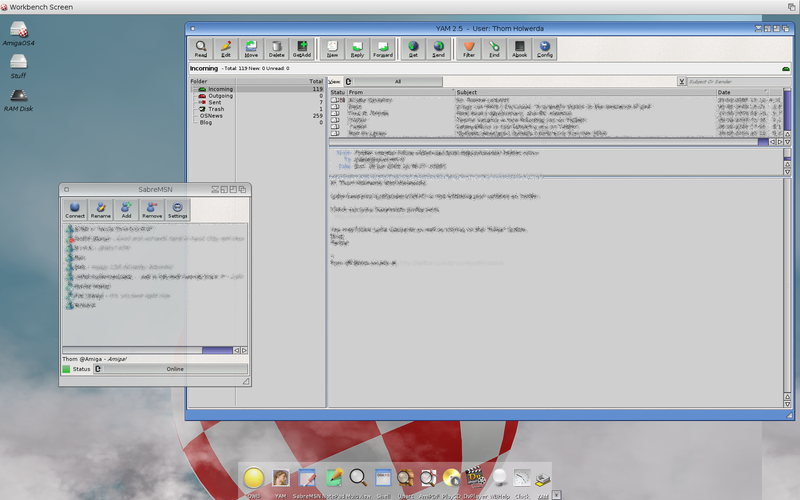 AmigaWriter is still being sold, but its last update was in 2000, so it’s a classic application. It does provide a lot of functionality, including compatibility with .doc files. The Amiga was also a strong contender in other areas, such as desktop publishing and 2D/3D imaging. For instance, the special effects in Babylon 5’s pilot were rendered on a networked set of Amigas. Pagestream is a capable desktop publishing package, last updated in 2004, which is still sold and used today. Photogenics is also still available; this is Photoshop-like program for the Classic Amiga. Moving away from applications to more general operating system features, the USB stack in AmigaOS 4.1 is decent, recognising just about anything I could throw at it; keyboards, mice, card readers, hubs, my printer – they were all recognised. My printer did not work correctly though, but I attribute this to the printer (it’s old and flaky at times). Something that stood out to me in a negative way was the performance of file operations, especially when looking at USB operations. This is definitely an area which could use some optimisation. AmigaOS 4.1 also has hardware accelerated graphics, but what exactly this brings me is a bit vague to me. You get transparency effects when dragging windows around, which doesn’t seem like a particularly useful feature to me. For an operating system that lacks a few key applications, it doesn’t seem like wisdom to me to focus on something as superficial as a few fancy effects. I’m sure 3D accelerated graphics brings more than just transparent windows, but I’d still argue that getting your application portfolio in order is more important. So far, I’ve been able to completely avoid the massive elephant in the room (he’s in the corner, right there, you can’t miss him): the lack of protected memory. Technically, AmigaOS 4.1 does have memory protection (contrary to version 4.0), but it’s turned off and the user cannot turn it on. The problem is that many applications do not expect an operating system with protected memory, and as such, turning it on would cause massive breakage. This is a problem not even Apple could solve – Copland failed, and even though Mac OS 9 had protected memory in the kernel, it wasn’t turned on either. How does the lack of protected memory affect day-to-day usage? Well, in all honesty, the operating system was very flaky and crash-prone when I first installed it. Random crashes would lock up the entire machine, and only a hard reboot would fix the situation. Luckily though, Hyperion released an update for AmigaOS 4.1 recently, which seems to have fixed the issue. Another issue the update resolved was the random appearance of graphical glitches all over your screen (rogue pixels, lines, you name it). By the way, an additional benefit of having protected memory is that AmigaOS 4.1 now supports virtual memory, which the operating system handles like Linux does it, with a dedicated swap partition.